But then cooler heads prevail and we realize that we actually need to manage the conflict, rather than just vent. 1. Call, don’t write. A friend of mine who works in corporate America once told me that one of the very first things she learned at her job was that the minute you have a professional conflict with someone, you pick up the phone. Never, ever email. And that’s because – according to her at least – there’s greater room for misinterpretation when you write something, whereas in speech you can be more direct. As a writer, my instinct is *always* to write to people when there’s potential discord because I feel I can control the message better. But ever since she told me that, I’ve reconsidered. The other reason, of course – and pace the recent WikiLeaks scandal – is that once you put something in writing, it lives on ad infinitum. And then it can come back to haunt you. 3. Write an email, but don’t send it. I was once offered a job when I was first on the academic job market which I turned down – albeit with some remorse. And I felt so badly about turning it down that I compose this incredibly long, heartfelt explanation to the Department Chair. And then I threw it away. Because when I woke up the next morning, I realized that the letter was really written for me, rather than for him. In a similar vein, I’ve taken lately to writing out long emails to people I’m angry with and then not publishing them. As a writer, putting my thoughts down on the page helps me to express and even clarify my feelings, but without experiencing any of the blowback discussed in point #2. 4. Try to see it through their eyes. I got an email the other day that really irritated me. It was condescending. It was territorial. And it was bitchy. Or at least so I thought the first time I read it through. And I spent a good deal of the night composing a response (in my head) that I seriously debated sending to this person, despite my advice in #3. But when I came downstairs the next morning, I re-read the email and decided that – even though I was pretty sure that my initial reaction was justified – there was conceivably another way to read said email that put it in a more favorable light. And so – taking Gretchen Rubin’s maxim – “act the way we want to feel” – to heart, I willed myself to reinterpret the original email as more benign so that I, too, could feel more positively towards this person. And then I just ignored it. 5. Write a letter. This may sound like it contradicts point #1 – and I certainly wouldn’t recommend it in a professional setting. But sometimes I think that writing a good, old-fashioned letter can go a long way towards smoothing over differences between friends and family. For starters, in an internet age, everyone appreciates that letter-writing has gone the way of the horse and buggy. So when people take the time to actually write down their thoughts – with a pen! – it shows how much they matter to you. Second, while most people like their emails short and digestible, it’s O.K. to write a long letter and to really elaborate on what you’re feeling. I once did this with a friend and it really saved our friendship. How about you? What strategies do you employ to manage conflict? 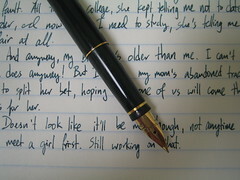 Image: Writing Samples: Parker 75 by churl via Flickr under a Creative Commons license. Whatever seems to work best at the moment, hoping that I do my screaming & swearing in private (obviously, this reaction rules out a phone call!) Sometimes an email or even a letter really is necessary, tho’ in a sticky situation I re-read & re-write what I’m sending very carefully. This is so well put and I will be sharing your words on my FB page. How many of these lessons have come with pain? That is why at 53, I am still learning to be an adult. And will continue to do so for all of my days. The whole topic of email makes me shudder – oh, so many misspoken words and sentiments said in haste when I was back in the corporate world. I do not miss that. @Fran-thanks so much. And it is SO reassuring to hear that I’m not the only one still learning to be an adult! I neglected to add my own strategies for NOT falling into the bad traps. The best practice for me is to stop and wait. If I react in the heat of the moment, wisdom fails and conflict worsens. And talking is much better than writing. As Daryl says, if writing is necessary, then a careful re-reading and then careful crafting of a reply is vital. However, I find that patience and taking many deep breaths, and saying what is honest and not just let my emotions do the talking is the best path for me. And for others dealing with me. In the end I do not fear or avoid conflict – nor do I love it or seek it. I just find that conflict and effective resolution, are essential to good living. @Delia – anyone claiming to already know all the ins and outs of being an adult is to be regarded with some suspicion! I need to take a step back, pick up the phone (or walk down to the person’s office) and resolve it the old fashioned way. yes, exactly, leah. we’ve all been there – I wish sometimes there were an “unsend” button! Thanks for your blog, blogs…After reading one, I read another and another! Great stuff! I’ll be back! so glad that it spoke to you, dafina! it is usually best to wait, I find. though I’m not always that good at it either!